Oct. 28, 2014 Sacramento, CA -- The California Manufacturers & Technology Association (CMTA) announced this week that President Jack Stewart will be retiring at the end of 2014 and that CMTA's Board of Directors will promote Vice President of Government Relations Dorothy Rothrock as its new president. Stewart notified the Board of Directors last year that he would retire from the Association at the end of 2014. 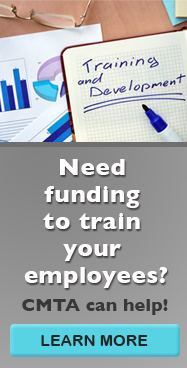 The Board of Directors and CMTA staff have spent the last ten months preparing for the transition. Stewart started with CMTA under former President Bill Campell as the association's Executive Director in 1992. When Campbell retired in 1997, Stewart took over as President. Stewart has overseen many legislative and regulatory accomplishments for the state's manufacturers in his 23-year tenure at CMTA. Most importantly he pushed for two manufacturing tax credits in 1993 and in 2013 to help manufacturers compete and invest in California. Other policy victories include increasing the legislature's awareness of the growing need for career technical education and workforce development in our schools, and leading the Association's substantial efforts on California workers' compensation reforms. "Jack never stopped fighting for California manufacturing's best-in-the-world innovation, high wages and tremendous opportunities," said past CMTA Chairman and previous Boeing executive Michael Jackson. "He took up the manufacturing cause in an extremely effective way with his effusive charm and hard working ethic." Rothrock joined the Association in 1999 as its energy lobbyist and she quickly filled the vacancy of chief lobbyist in 2000 with the departure of Gavin McHugh, who left to start his own advocacy firm. Before she joined CMTA Rothrock consulted on energy and telecommunications regulatory issues for industrial energy users, policy advocates, and economic research firms. She began her career at Portland General Corporation as an attorney, moving to management positions in commercial operations, public affairs and power marketing prior to relocating to California in 1990. Since joining CMTA in 1999, Rothrock worked with her team of lobbyists on issues of importance to manufacturers, including energy, climate change, civil justice, workers' compensation, labor, tax, environmental quality and education. "The choice was crystal clear on who should take over the leadership of CMTA after Jack announced his retirement," said CMTA Board member and O-I (Owens Illinois) executive Dan Steen. "Dorothy's strategic mind, leadership qualities, grasp of California manufacturing challenges, and relationships with the Capitol community will help keep California manufacturing highly competitive at a time when the rest of the country is fighting so hard to attract investments." "Jack will be missed, for sure," said CMTA Board member and California Steel Industries executive Brett Guge. 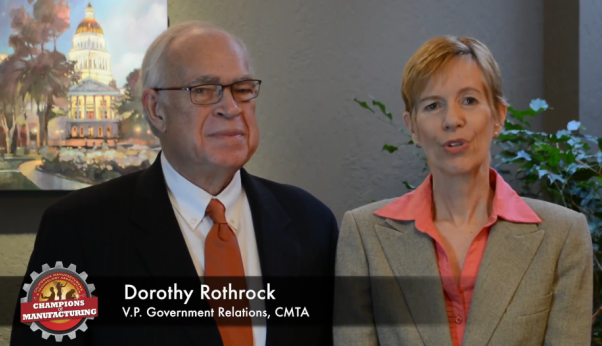 "However, we are really fortunate to have Dorothy Rothrock already on board as the obvious successor to the presidency of CMTA. She is well respected in Sacramento and across the state, and she is a great leader and fighter for California manufacturers and the wonderful jobs we provide." Rothrock graduated from the University of Oregon and Lewis and Clark Law School, joining the Oregon Bar in 1980 and the California Bar in 1997. CMTA previously announced that Michael Shaw would be replacing Rothrock as the Association's VP of Government Affairs. Shaw started at CMTA in early October. There is a retirement reception for Stewart on Wednesday, October 29 at 5:00 p.m. at the Citizen Hotel on J and 10th Streets in Sacramento. If you would like to attend please rsvp to Geri Royer at groyer@cmta.net. Stewart and Rothrock filmed their video announcement of the leadership change. You can view it here (or click the image below). They will both spend the last two months of 2014 ensuring a smooth transition.